A new approach to spam journals? This is a new one. I’ve received invitations to submit to what appear to be spam journals well outside my field, and I’ve received conference invitations to present at conferences well outside my field. But this is a new one – an invitation to review a paper well outside my field that will (a) make me a member of the Technical Program Committee for a workshop and receive a discount on registration as a result. Keep in mind as you read this that my expertise is in plant evolutionary genetics and population genetics. I know molecular biologists, even some who have worked on membranes, but I am not a membrane biologist, and I don’t even play one on TV. Due to your innovative findings in the field of Biology, we need your expertise for reviewing one or two papers in a special issue to be published in Molecular Membrane Biology (2015 Impact Factor: 1.983). This reviewing will entitle you to become a member of the Technical Program Committee of the Workshop on Molecular Biology, and will give you a discount in case you will attend the 6th International Conference on Biomedical Engineering and Biotechnology (Oct.17-20, 2017 Guangzhou, China). You may also send your report there to be published in the special issue. If you are too busy to attend our conference and/or review the papers, we would appreciate if you recommend us your colleagues or subordinates who can represent your honorable institution in our international cooperation. Please feel free to contact me on this or related issues. Jasper Slingsby is the lead author on a recent paper in the Proceedings of the National Academy of Sciences describing some of the work he, John Silander, and others did as part of our recently concluded Dimensions of Biodiversity project. Here’s the abstract. Follow the links below to find the full paper and a story about it in UConn Today. Prolonged periods of extreme heat or drought in the first year after fire affect the resilience and diversity of fire-dependent ecosystems by inhibiting seed germination or increasing mortality of seedlings and resprouting individuals. This interaction between weather and fire is of growing concern as climate changes, particularly in systems subject to stand-replacing crown fires, such as most Mediterranean-type ecosystems. We examined the longest running set of permanent vegetation plots in the Fynbos of South Africa (44 y), finding a significant decline in the diversity of plots driven by increasingly severe postfire summer weather events (number of consecutive days with high temperatures and no rain) and legacy effects of historical woody alien plant densities 30 y after clearing. Species that resprout after fire and/or have graminoid or herb growth forms were particularly affected by postfire weather, whereas all species were sensitive to invasive plants. Observed differences in the response of functional types to extreme postfire weather could drive major shifts in ecosystem structure and function such as altered fire behavior, hydrology, and carbon storage. An estimated 0.5 °C increase in maximum temperature tolerance of the species sets unique to each survey further suggests selection for species adapted to hotter conditions. Taken together, our results show climate change impacts on biodiversity in the hyperdiverse Cape Floristic Region and demonstrate an important interaction between extreme weather and disturbance by fire that may make flammable ecosystems particularly sensitive to climate change. That prior on tau should be a red flag. Gelman (citation below) pointed out a long time ago that such a prior is a long way from being vague or non-informative. It puts a tremendous amount of weight on very small values of tau, meaning a very high weight on large values of the variance. Similarly, the N(0, 100); prior on mu; may seem like a “vague” choice, but it puts more than 80% of the prior probability on outcomes with x < -20 or x > 20, substantially more extreme than any that were observed. Before we begin an analysis we typically have some idea what “reasonable” values are for the variable we’re measuring. For example, if we are measuring the height of adult men, we would be very surprised to find anyone in our sample with a height greater than 3m or less than 0.5m. It wouldn’t make sense to use a prior for the mean that put appreciable probability on outcomes more extreme. In this case the data are made up, so there isn’t any prior knowledge to work from. but the authors say that “[i]t is immediately obvious that the sixth data point is an outlier” (emphasis in the original). Let’s take them at their word. A reasonable choice of prior might then be N(0,1), since all of the values (except for the “outlier”) lie within two standard deviations of the mean.3 Similarly, a reasonable choice for the prior on sigma (sqrt(1/tau)) might be a half-normal with mean 0 and standard deviation 2, which will allow for standard deviations both smaller and larger than observed in the data. So if you use “reasonable” priors, you get a posterior mean from a model without contamination that isn’t very different from what you get from the more complicated contaminated normal model, and the credible intervals are actually narrower. If you really think a priori that 15 is an unreasonable observation, which estimate (point estimate and credible interval) would you prefer? I’d go for the model assuming a normal distribution with reasonable priors. It all comes down to this. Your choice of priors matters. There is no such thing as an uninformative prior. If you think you are playing it safe by using very vague or flat priors, think carefully about what you’re doing. There’s a good chance that you’re actually putting a lot of prior weight on values that are unreasonable.4 You will almost always have some idea about what observations are reasonable or possible. Use that information to set weakly informative priors. See the discussion at https://github.com/stan-dev/stan/wiki/Prior-Choice-Recommendations for more detailed advice. 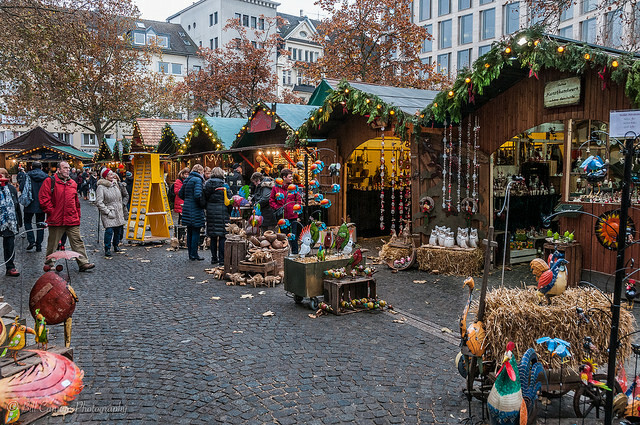 Christmas market in Bonn, December 2016. Click on the photo to see the entire album on Flickr. Late last November I visited Bonn to participate in a small workshop sponsored by the Crop Trust (https://www.croptrust.org/) intended to develop criteria to assess whether germplasm collections of crops and crop wild relatives are sufficient to meet the Millenium Development Goals. I was there not because I know a lot about crop germplasm (I don’t), but because my expertise in analysis of genetic structure in plant populations and my work on plant conservation genetics provided some (I hope) useful context for the discussions. I didn’t have a lot of time to explore Bonn, but I did have a couple of hours on the afternoon I arrived and most of the morning on the day that I left. If you’d like to see the photos I thought were worth saving, click on the image above to visit a Flckr album where you can see them all. This week the University of Connecticut expressed its appreciation for employees. I am nearing the end of my 31st year with the University, and I’ve heard through the grapevine that I’ll be receiving a “surprise” gift recognizing 30 years of service at a meeting I’m attending next week. On Tuesday, I presented a gift to an employee of The Graduate School recognizing 35 years of service as a state employee. 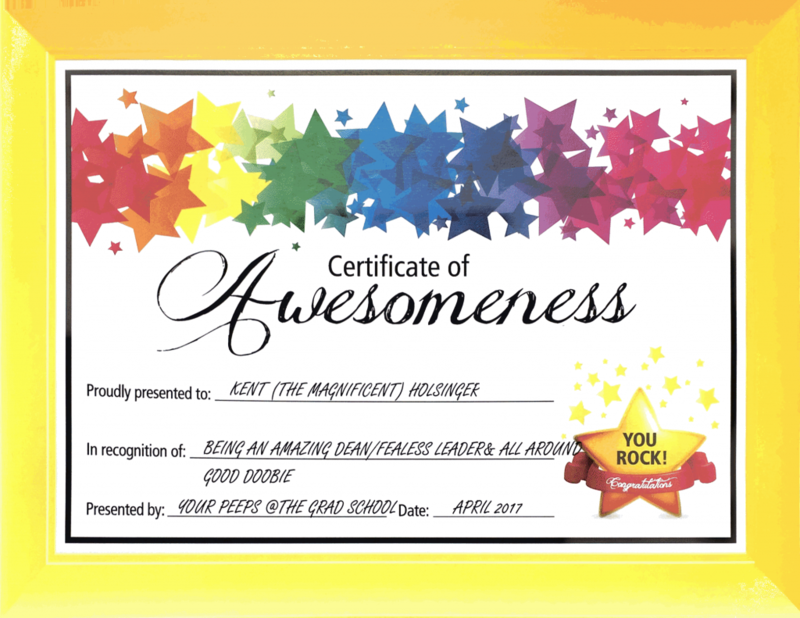 I was surprised and gratified to receive the unofficial “Certificate of Awesomeness” pictured above from members of The Graduate School staff. I feel very appreciated – and fortunate to have been a part of UConn for more than 30 years. Recent debates about the future of conservation have been dominated by a few high-profile individuals, whose views seem to fit fairly neatly into polarised positions. In this survey, we are exploring the range of views that exist within the conservation movement globally, and how this varies by key demographic characteristics such as age, gender, geography and educational background. Your position is weakly negative along the people & nature axis and weakly positive along the conservation & capitalism axis. Your position on the two axes above reflects your survey answers. 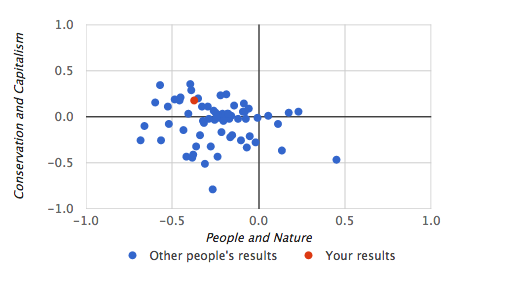 A move from left to right along the horizontal axis (people/nature) implies a shift from seeing conservation as a means of improving human welfare to conservation for nature’s own sake. The vertical axis (conservation & capitalism) indicates a spectrum of willingness to embrace markets and capitalism as conservation tools: the higher up the graph your score is, the more pro-markets it is. This places you in the top left quadrant of the graph – a position suggesting your views on these particular dimensions of the debate are most closely related to those of ‘new conservationists’ as set out in the literature. Central to the ‘new conservation’ position is a shift towards framing conservation as being about protecting nature in order to improve human wellbeing (especially that of the poor), rather than for biodiversity’s own sake. ‘New conservationists’ believe that win-win situations in which people benefit from conservation can often be achieved by promoting economic growth and partnering with corporations. Although new conservation advocates have been criticised for doing away with nature’s intrinsic value, key authors within the movement have responded by clarifying that their motive is not so much an ethical as a strategic or pragmatic one. In other words, they claim that conservation needs to emphasise nature’s instrumental value to people because this better promotes support for conservation compared to arguments based solely on species’ rights to exist. If you’re interested in taking the survey, here’s the link: http://www.futureconservation.org/. I visited Dublin a couple of weeks ago for meetings of the Deans and Directors of Graduate Studies (DDoGS) from Universitas 21 (http://www.universitas21.com/article/research/details/55/deans-and-directors-of-graduate-studies-ddogs). The meeting began on 20 March with a workshop on “The Future of the Doctorate.” It continued on 21 and 22 March with discussions of graduate research project grants, the possibility of a 3-MT competition for master’s students, plans for a supervisor development project,1, and a discussion of wellness and mental health. This was the fifth DDoGS meeting I’ve attended, and I’ve always found them useful. There is a direct flight from Hartford to Dublin. I left in the evening on 18 March and arrived in Dublin a little after 5:00am on 19 March. Since there weren’t any activities until 6:00pm that night, I spent most of the day on the 19th wandering around Dublin taking photographs. I also spent the day on 23 March taking photographs, since I didn’t return home until the 24th. 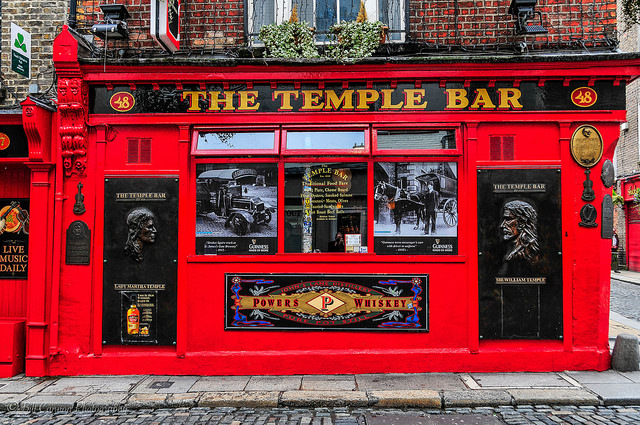 The photograph above is of Temple Bar, one of the most famous pubs in Dublin. If you’d like to see more of the photographs I took while I was there, here’s a link: https://www.flickr.com/photos/billandkent/albums/72157679862838432.